So excited to share what is a very locals-only Madrid spot – Taverna Andaluza Sacromonte. The neighbourhood of Usera is the “other” side of the Rio Manzanares, about a 15-minute walk from the cultural centre El Matadero. Or just take the metro – it is only 6 stops from Sol! You will emerge in a busy little square that feels very village-y, and you immediately feel you have left tourist-land. Usera has become better-known recently due to the growing population of Chinese people who have settled here – Chinese food connoisseurs know that the best, cheapest and most authentic Chinese restaurants are to be found here. Taverna Andaluza Sacromonte is a classic Southern Spanish-style bar and just the thing if you are not in the mood for Chinese, or if you want to mix it up with an aperitif and tapa before your Sichuan feast! They have a fantastic selection of wine by the glass – ask the friendly staff to recommend one if you aren’t sure what to choose. The tapas are great here – if you have spent any time at all in Spain, you’ll know what you are given with your drink (please never ask for tapas!) can vary wildly from bar to bar. And while some crisps, nuts or olives are always welcome, some bars like Sacromonte go the extra mile and offer something gourmet. 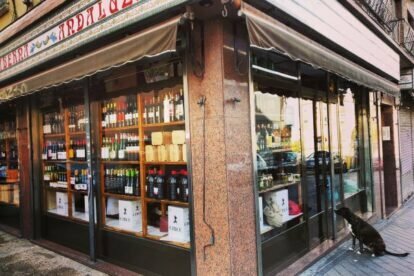 I also love the inside of this bar – the bottle-lined shelves with wines and liqueurs from all over Spain are practical and decorative.